I can tell this is a film that should be seen in a theater, no, that needs to be seen in a theater. It has no story, but unlike a Brakhage film which you may want to study at home and watch over and over, this is meant as an experience, more a ride than a movie. 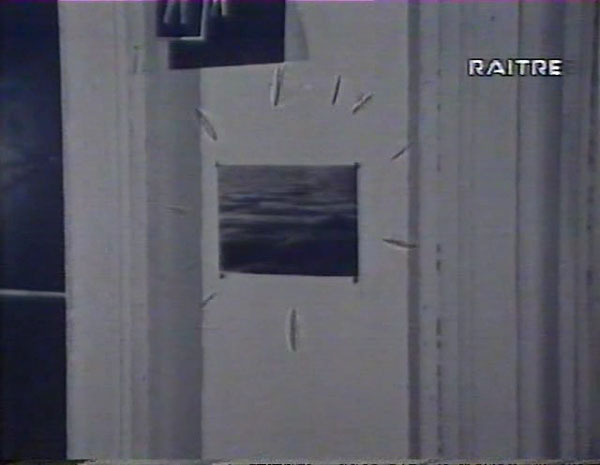 So I’ve done the movie great harm by watching it on my laptop, a reproduction of a reproduction of a TV screening, all low resolution with the corner of the image defaced by a station logo. One could already convincingly argue that I haven’t seen La Region Centrale at all, under those conditions – but wait, it gets worse. The experience builds (probably) over its three-hour running time, becomes (probably) more mesmerising and abstract as the third hour wears on. But I kept putting it on after midnight then falling asleep watching it, continuing the next night, as if picking up the story where I’d left off. And wait, there’s more. I thought for sure I could handle the last 45 minutes at a time without falling asleep again (wrong, lasted 35) but I soon got tired of the constant whirring sound effects (conforming to the strict rule that avant-garde films need always have annoying soundtracks) so I muted the movie and put on the latest Mogwai album instead. All these crimes I committed against the movie, but I still liked it quite a lot, certainly better than Wavelength. Most of the Michael Snow movies I’ve been able to see have been interesting, but also more fun than tedious (again, all but Wavelength) which is exceptional in the avant-garde scene. Arguably the first feature filmed by a robot, Michael Snow’s three hour exploration of the possibilities of camera movement over a barren Arctic landscape suggests many things: sci-fi space probe footage more authentic than George Lucas; a rebuff to the romantic frontier landscapes of Hollywood Westerns; an avant-garde equivalent of an amusement park simulator ride. 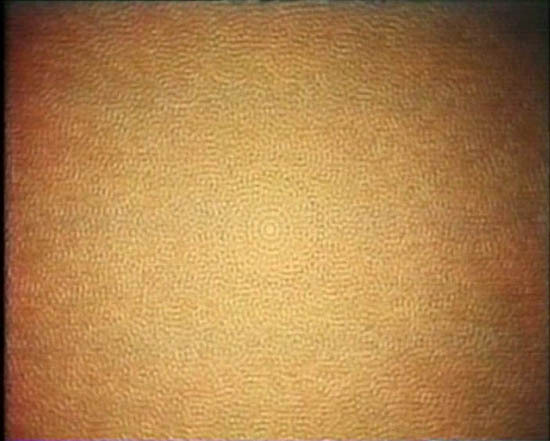 Lensed by a specially designed rotating camera mount pre-programmed to move with stunning variety, the film begins as a slow, soothing meditation on the otherworldly textures of the Canadian wilderness, but gradually morphs into a dizzying, terrifying freakout, a relentlessly spinning gaze that pummels the equilibrium of the human eye. The film pushes the boundaries not only of human sight but of the physical earth, destroying gravity and transforming a lifeless vista into a cosmic force of light and energy. Clinically scientific in its approach yet yielding an organic, even spiritual wonder, La region centrale does not merely vindicate the oft-neglected genre of experimental film, but thrusts itself into the center of cinema at its most vital. My favorite motion is twenty minutes before the film’s end, the camera rotating while turning, but not in synch with each other, making the landscape look small and spherical but ever-changing. The film will become a kind of absolute record of a piece of wilderness. Eventually the effect of the mechanized movement will be what I imagine the first rigorous filming of the moon surface. But this will feel like a record of the last wilderness on earth, a film to be taken into outer space as a souvenir of what nature once was. I want to convey a feeling of absolute aloneness, a kind of Goodbye to Earth which I believe we are living through. … It will preserve what will increasingly become an extreme rarity: wilderness. Perhaps aloneness will also become a rarity. At any rate the film will create a very special state of mind, and while I believe that it will have no precedent I also believe it will be possible for it to have a large audience. This was both wonderful – an inventively whimsical little ride of a rigorous art film – and tedious in that way that non-narrative films can be. It wouldn’t be a Snow work if it didn’t test my patience a little – it’s part of his charm. This kind of thing is always very different with an audience, not that I think it’s likely I’ll ever get the chance. I picked up visual similarities to Presents and Sshtoorrty… not so much Wavelength unless you count every zoom as a reference to Wavelength (which I guess some critics do). People walk through a door with the title printed on it (this is where the zoom comes in), while we hear Snow, offscreen, instructing each on the entrance of their timing. Cut to inside the office, and the camera rolls to the right, an infinite camera move since the set is digitally joined at the seams. He electrocutes all his actors, a chair disappears in a lap dissolve, blatant digital effects pop up, then the picture twists like a ribbon as it transitions to next scene. Apparently these are many different actors dressed similarly to give the appearance of a regular cast of characters, but I can’t see subtleties like that on my VHS copy… a shame. 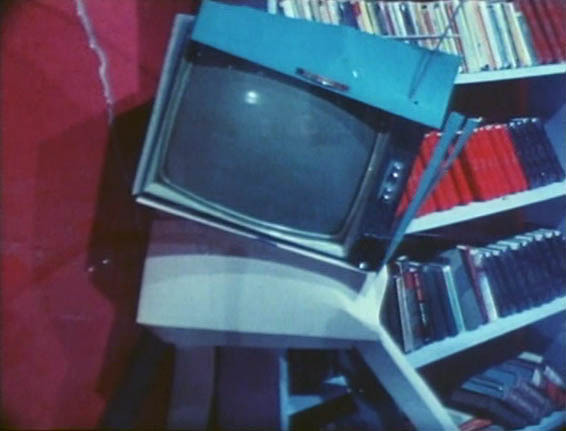 A family sits in their garishly (digitally) decorated living room with a wall mirror reflecting the camera until objects fly off the wall and destroy themselves while the people sit still staring at the sky inside their television. Obnoxious noise permeates, except when one would expect a sound effect (during an explosion, say) when it goes silent. A classroom is shot from above until the kids notice the camera, stack their desks so they can reach it. 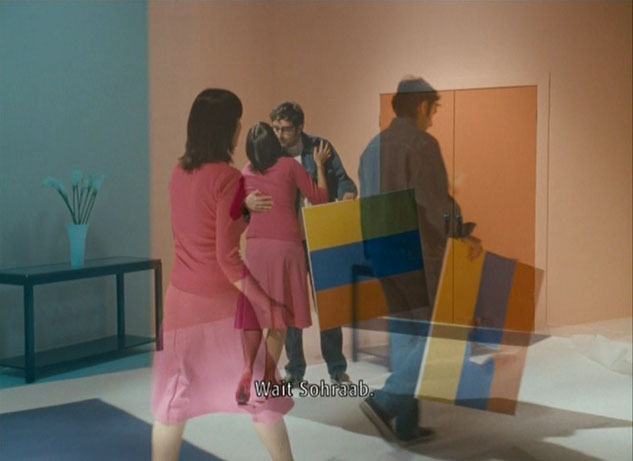 Two people enter a too-small doorway at the same time, fusing and morphing into a slow-moving doorway-shaped block, which lumbers back into the infinite-loop office set. The credits show up before the hour mark and begin to lap themselves. The whole movie rewinds. 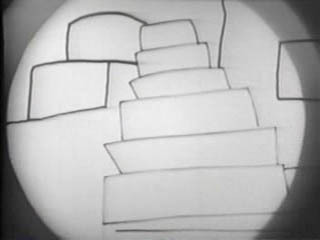 Then at the end a couple enters a cinema and sits down to watch an early animated work by Snow. J Hoberman calls it “that rarest of things—a summarizing work. 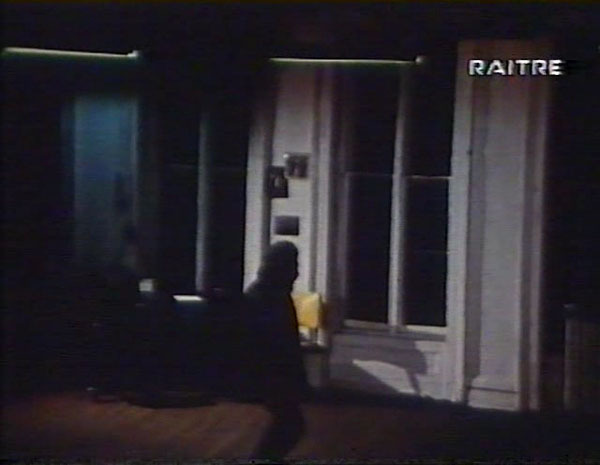 Like Chantal Akerman’s Jeanne Dielman or Chris Marker’s Sans Soleil, it could be used to conclude Motion Pictures 101. … Rigorously predicated on irreducible cinematic facts, Snow’s structuralist epics – Wavelength and La Région Centrale – announced the imminent passing of the film era. Rich with new possibilities, *Corpus Callosum heralds the advent of the next. Whatever it is, it cannot be too highly praised. Similarly, domestic life in *Corpus Callosum is irrevocably altered by innovations. The home is filled with televisions, pizzas, and empty glasses. Intense oranges and pinks make the living room seem alive and breathing. The walls are decorated with paintings, an eye-test chart, a crutch, and a skeleton. A mirror reflecting what appears to be Snow and his film crew forms the focal point, reminding us that this film has an author, just as our own environments have human creators. In one 12-minute sequence, objects on the walls begin exploding, one at a time, into beautiful pixel starbursts. Snow, the reflected “god” (for he is creator of this space and the characters who dwell within) appears here to be an Old Testament type: he can give and he can take away. In keeping with his lighter side, *Corpus is also fun … But then it starts to feel as if things are going on for too long. Mr. Snow realizes he is literally playing with time, though, and even jokes about it: he inserts the credits in the middle of the picture. … We get the point, but the movie goes on and on, using repetition to comment on repetitive behavior. 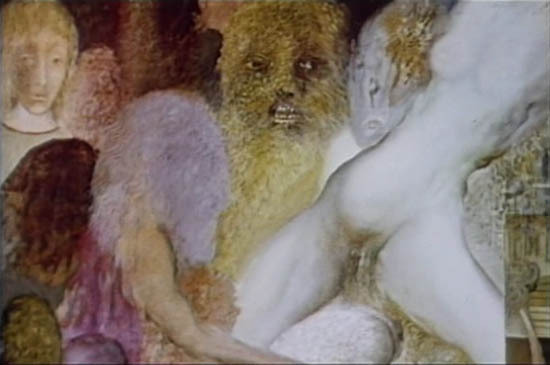 The sound – electronic like the picture – is also a continuous metamorphosis and as the film’s “nervous system”, is as important to the film as the picture. Or: the sound and the picture are two hemispheres joined by the artist. *Corpus Callosum is resolutely “artificial”, it not only wants to convince, but also to be a perceived pictorial and musical phenomenon. … a shame, since my copy had lousy sound. Funny that I watched this the day after The Last Movie, since it turns out Snow put out a record called “The Last LP”. Offscreen: Has it changed over the years, the audience reception? Michael Snow: Yes. I don’t know what is happening to people but they are not as tough as they used to be. … I really want to make physical things so that the experience is a real experience and not just conceptual. Well yes there are ideas in the works, but they are also body affects, like the panning, for example in Back and Forth. I’ve seen someone get sick and people have fainted with La Region Centrale, so I must be doing something right. Thanks to Andy, I finally had the chance to see one of the most talked-about avant-garde films of all time. While it’s important to talk about experimental film, it’s more important to actually see the damned things – and while anyone can order a copy of Visionary Film for $26.95, it’s nearly impossible to see Wavelength on any given day. Unfortunately, it’s one of those times (see also The Leopard) when I check out one of the Great Important Works of Cinematic Art and come out less than impressed. I didn’t find the audiovisual experience very enlightening compared to the descriptions I’ve read of the film. Didn’t dislike it (though I came close to disliking the soundtrack) but not an overwhelming experience like Zorns Lemma, either. A few updates to those written descriptions: (1) It’s not a single, continuous zoom a la Last Days – the zoom moves sporadically and the camera slightly changes position from time to time. (2) There’s sound – a sinewave tone that starts low and ends high, with other quieter tones joining it at times and sync sound during the four action scenes. Those action scenes: Woman gets bookshelf delivered, two women listen to “Strawberry Fields Forever”, man dies, girl makes phone call expressing concern that there’s a dead man in her apartment. (3) There’s a twist ending – after zooming the full length of the apartment, the photograph on the wall is of waves in the sea. I get it, ha ha. After reading Sitney and Snow, I see why the movie is interesting, even exciting in theory, but the viewing experience just wasn’t there… wouldn’t want to see it again anytime soon. Actors included Joyce Wieland and Hollis Frampton (as the man who dies). Assisted by Ken Jacobs, and sound by Ted Wolff, who unsurprisingly didn’t do any other film sound after this. Snow screws with the camera a bunch: focus, filters, film stocks (supposedly – I hardly noticed), light settings, time of day and lighting inside, etc. My favorite part is one or two frames where the picture on the wall towards which we are slowly zooming is highlit by a sunburst of drawn lines (screenshot below). I’m glad I got to see it anyway, and glad Andy played this and not Warhol’s Empire or something. When I got home, watched WVLNT (2003) and Prelude (2000). The former was a shortened version of Wavelength “for those who don’t have the time” – he cut the movie into three equal parts and superimposed them. Except for the now-intolerable soundtrack, I liked this version much better! There’s much more to look at. Prelude was a cute intro bit from the same Toronto Film Festival that brought us The Heart of the World. It’s hard for me to tell exactly how cute since my copy is such low-quality (think it came from streaming realvideo on the TIFF site), but it seems to be a single camera take, clean picture on a clean set, with unsynched sound edited in all over the place – actors and film crew talking about films in general and the one they are presently inside. This and WVLNT travel a similar road as Snow’s SShtoorrty, with its color-coordinated set, single camera move and superimpositions. aka Short Story, but I much prefer the above title. I even prefer the title to the movie itself, though the movie is pretty cool too. 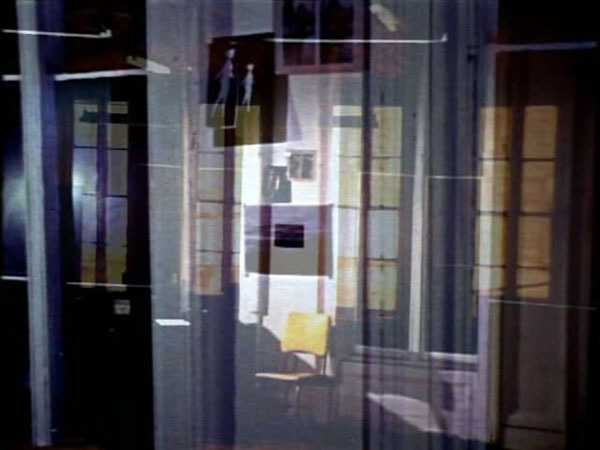 A two-minute loop of a four-minute scene, the first and second halves playing at the same time, with neat overlapping of color and audio. The scene was hard-subtitled (dialogue in Farsi), so even the subtitles overlap. Then the scene repeats, presumably about 10 times, though my downloaded copy broke after about six. I thought that was sufficient. The set looks like the Presents set, with that staginess and simple color washes. Writing about my films has sometimes discussed the ‘narrative’ aspect or ‘reading’ of some of my ‘pictorial’ nature, which is much more important. Reflecting on this, I realized that I have never wanted to make a purely narrative film, never had and therefore perhaps I should. Perhaps I should finally make a film that really tells a story. Thus ‘SSHTOORRTY’. … The film of the … scene was cut exactly in half and the two halves of sound and picture as super-imposed. This makes a simultaneity of actions that occurred ‘linearly’. Before and After become a Transparent Now. Arrival and Departure are united. It’s truly ‘filmic’, one transparent film over another. The famous one! Kuchar plays a film director whose actress quits mid-shoot out of disinterest and because George has asked her to take her clothes off. He calls around but finds nobody else, and falls into a crisis. Hilarious little movie. Played very straight, as George claims he was actually quite depressed. I wouldn’t say that the editing reminded me of Breathless and Parajanov, but Steffen did say that. The young Kuchar brothers discovered three people who look completely unlike movie stars and began filmmaking careers in order to get these people onscreen. This sums up what makes Kuchar interesting and worth watching, and where all the John Waters comparisons come from. A glorious no-budget fake melodrama starring the ‘differently-shaped’ Arline, Edie and Harry. Sylvia promises that if Mike will only settle down and marry her, she’ll lose weight. The joke ending is that eight years later, they’re married and she’s lost three pounds. I’m not doing a good job describing these movies, and I don’t even remember which one this is because I’ve waited too long after the screening to write about ’em (ten days is too long?!? ), but they’re totally fun to watch, short enough to never outstay their welcome, and different enough from each other to make seeing a bunch in a row worthwhile. It was a hoot of a screening, and I’d watch any one of ’em again. GK: “Painstakingly filmed and edited, it will be painful to watch, too.” This was my favorite of the bunch, just awesome. Unbelievably, I couldn’t remember what to say about it so I just watched it again on Ubu web… and I still don’t know what to say about it! Um, something about piano playing and humiliation and the color red? It’s poetry, and it is awesome. Starring Joyce Wieland, Michael Snow’s wife. I think this one was less narrative than the others, and I’ll leave it at that. George with a late-70’s mustache reminiscing on the time he shared with his dog Bocko. 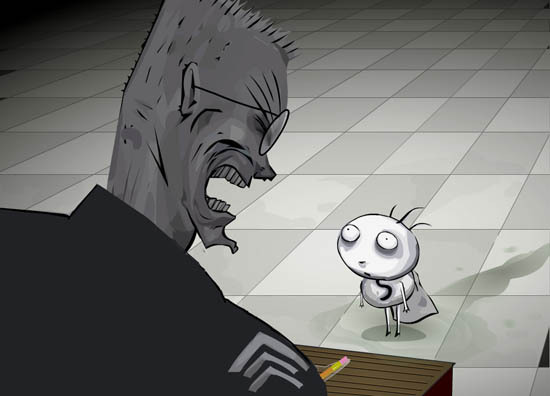 Brief sound dropouts were replaced in post-production with tiny bursts of music, keeping a playful edge on this otherwise diary-like personal short. As watched on Ubu web. 6 minutes long, storm over a motel builds into the night. Probably some nice footage, but the online video flattens it out and uglies it up, and my sound dropped out after a minute. No substitute for the wonderful Eyedrum screening. At first I read the title like “Alfred Hitchcock Presents…” but now I think it’s more like Christmas presents. PREH-sents. We’ll never know for sure. A line sloooowly twists itself into an image of a room with a naked woman on a bed, slooowly twists itself back into a line. The soundtrack is a terrible drone noise and I’m getting worried, watching the time pass on the DVD player face and asking myself whether Mr. Snow would approve if I watched his movie on fast-forward, or at least played some nice music and silenced his drone noise. Then I was thinking that Snow probably wouldn’t approve of my watching “Presents” at home on a TV with afternoon light from the windows glaring off the screen in the first place. So I’m better off not worrying about it. A few days later I watched a bunch more avant-garde films (shorter than this one) and started P. Adams Sitney’s avant-garde book, then returned to this, beginning when the wall falls and the montage part begins. I fell asleep again! Seen most of it by now, and I get the point, so I am quitting. The short shots in the montage section continue, camera always panning (note: camera mostly pans, not moves, but there’s clearly some movement in there), one shot cuts into the next with a drum hit, sometimes matching the same motion as the previous shot, sometimes changing direction, but always in motion, imitating the gaze of the human eye, oooh. After an hour and thousands of pans, the last cut is to a pink screen that fades to red then black. Don’t have it with me, but in the Sitney book the author says he uses the term “avant-garde” instead of “experimental”, because experimental implies that the artist is still messing around with his technique and doesn’t intend his film as a finished, planned piece. Can’t say that’s true of Presents, which was clearly planned, but it does feel experimental to me in that it’s an “investigation” of camera/eye movement which is actually interesting but I’ve found hard to watch. Snow bemoans that people’s attention spans for this kind of film aren’t what they used to be (hence his time-compressed reissue of Wavelength) and I guess I’m not helping matters by saying I thought this was too long. Snow says he used a “Quantel analog effect” to stretch and squeeze the image in the first ten minutes. 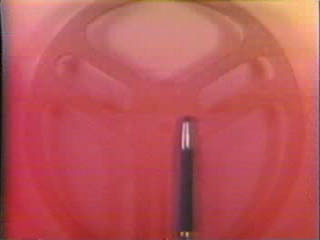 The apparent vertical scratch in celluloid that opens Presents literally opens into a film within the film. When its figure awakens into a woman in a ‘real’ unreal set, the slapstick satire of structural film begins. It is not the camera that moves, but the whole set, in this first of three material ‘investigations’ of camera movement. 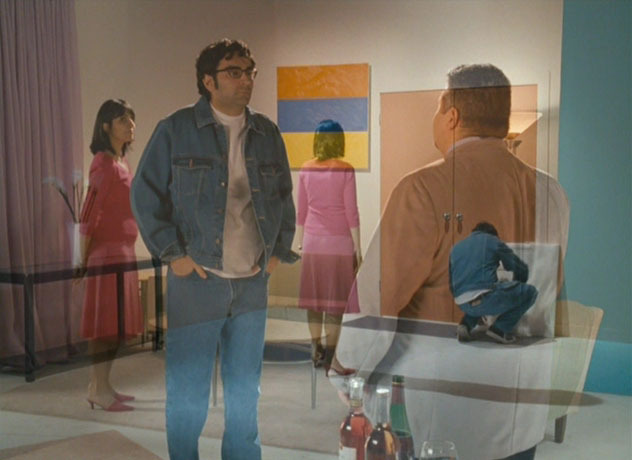 In the second, the camera literally invades the set; a plexiglass sheet in front of the dolly crushes everything in its sight as it zooms through space. Finally, this monster of formalism pushes through the wall of the set and the film cuts to a series of rapidly edited shots as the camera zigzags over lines of force and moving fields of vision in an approximation of the eye in nature. Snow pushes us into acceptance of present moments of vision, but the single drum beat that coincides with each edit in this elegaic section announces each moment of life’s irreversible disappearance. A major work, even when measured by the standards of Snow’s most impressive achievements. The title is a complex, provocatively ambiguous pun. The first section is a play based on the slipping and colliding senses of the word ‘presents,’ its homonyms, synonyms, and related concepts …. In the last section, assisted by the drum beat accenting each cut, the editing insists on the separateness of each shot and by doing so it constructs a vast inventory of different things and events. This extraordinary concluding montage sequence poses the most concerted and comprehensive challenge to the discourse of presen(ts)(ce) mounted by the film. Presents has something like three different modes in it. There is pushing and stretching, the tracking of the set, which because of convention you think of as camera movement, but you can see that the set is moving, then there is the smashing up of the set, followed by almost an hour of hand held pans which are from all over the world. Each one the pans is a different reaction to the scene with the camera. So that if the camera was moving in one way you might follow it or if the shape was round you would shoot it in a round way. One of the things I wanted to do was to cut each pan so that there would be no continuity from shot to shot, so they were isolated in time and space as these little instants taken from life. Pans are obviously much different from dollies or tracks. They are a glance. And they also reinforce a certain ephemerality, so there is a sadder aspect to the glance. It is recorded but then it is gone and then there’s another glance and it is gone. So that part of Presents is a particular thing that I have not done that much, a montage of things that have a tremendous variety, not in terms of the world itself but in terms of what you can gather from the world.